It is known as the “Town Called Courage”. Carluke is the birthplace of three brave men who were awarded the Victoria Cross. William Angus and Thomas Caldwell were honoured for their gallantry in the face of the enemy during the First World War and Donald Cameron during the Second World War. Janie Stewart, 101, is a member of Kirkton Church in Carluke. At that time, the South Lanarkshire town had a population of fewer than 8,000 residents which meant it had more recipients of Britain’s highest and most prestigious military honour per head of population than any other community. 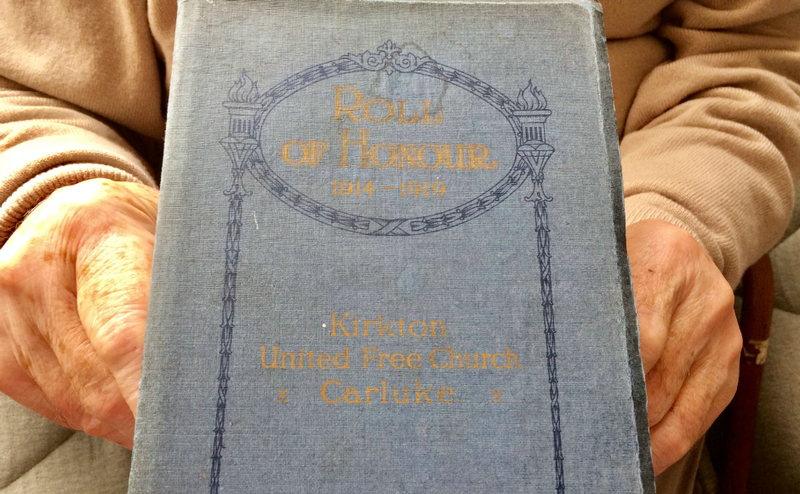 A total of 123 men from what was Kirkton United Free Church fought during the First World War and 23 of them did not return. 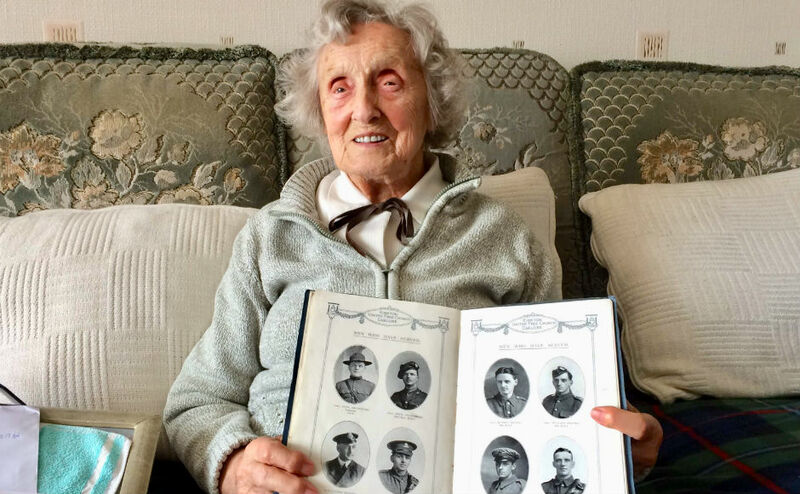 Their courage, bravery and sacrifice is recognised in a special Roll of Honour book – a unique historical artefact which is close to centenarian Janie Stewart’s heart. It contains the names and photographs of five members of the 101-year-old’s family who all survived the Great War and came home to Carluke. Wilson, Andrew and William Brooks were brothers and Ms Stewart’s uncles and Alexander and Robert Brooks were her cousins. 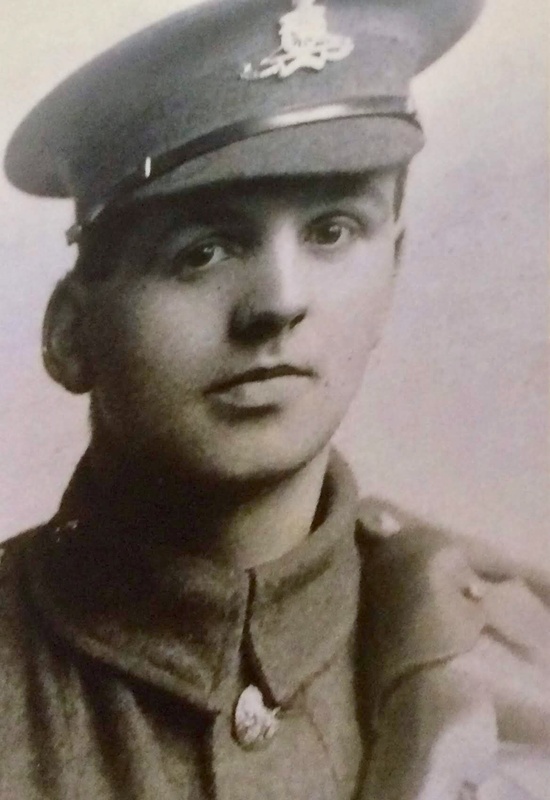 Ms Stewart, who has been a member of what is now Kirkton Church of Scotland all her life, revealed that her prized copy was gifted to her uncle Andrew “in recognition of his service in the Great War”. He served as a gunner with the British Army in France and after the war he owned a menswear shop in Glasgow and was a keen dog breeder. He judged bulldogs at events all over Britain including Crufts and died in 1988 at the age of 92. 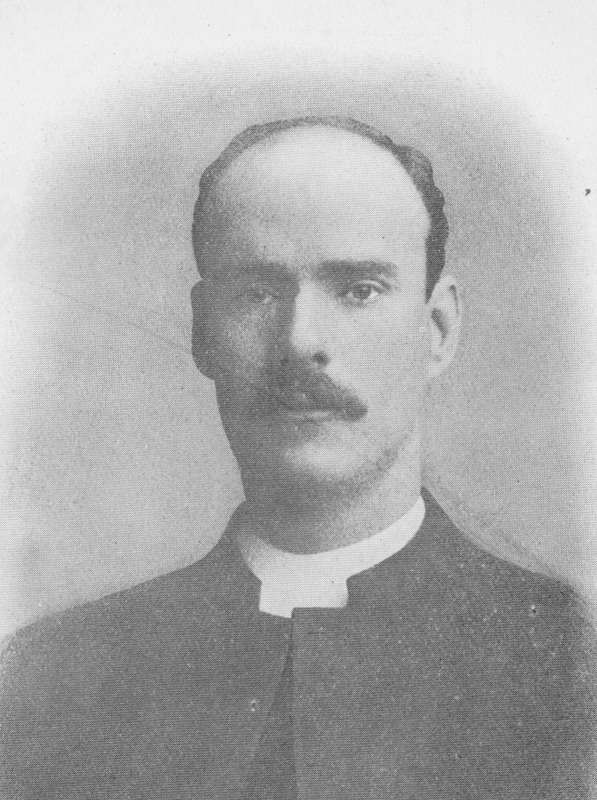 Rev Andrew Hunter, the minister of Kirkton United Free Church, served alongside the troops in France from August to October 1915 and survived. Remembrance display at Kirkton Church. Rev Iain Cunningham, minister of Kirkton Church, described his words as “an insight that is as relevant today as it was a century ago”. 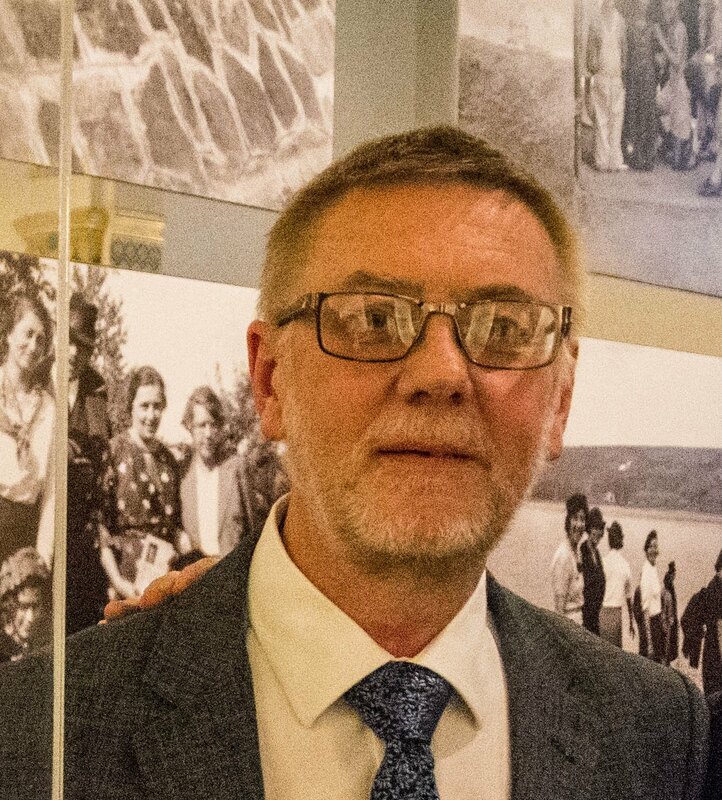 “The book produced at the end of the First World War is a thoughtful and respectful memorial to the 123 young men from Kirkton who answered the call to serve,” he added. “Sadly 23 of them did not return and nine received distinguished military honours. “There can be no doubting the immense courage demonstrated by the people of Carluke, especially by so many young men during those years of conflict. 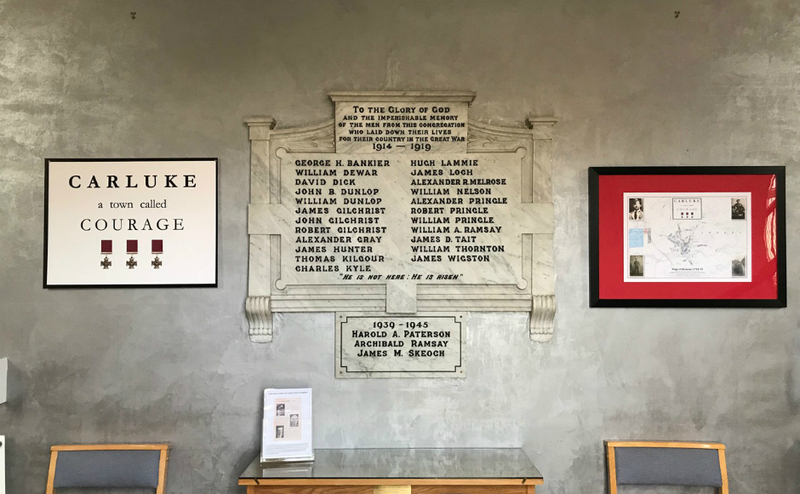 Copies of photographs in the Roll of Honour book are displayed in a single frame which hangs at the top of the stairs to the church balcony. 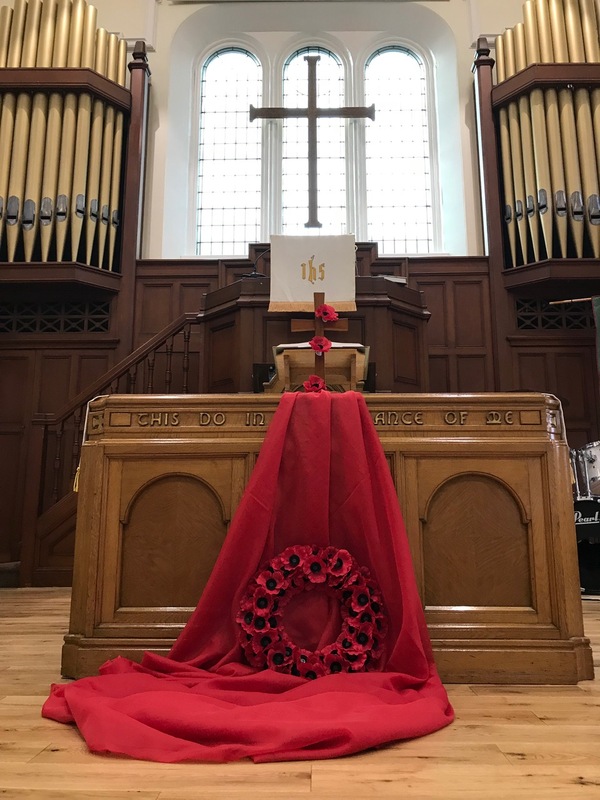 Mr Cunningham, a former convener of the World Mission Council of the Church of Scotland, said people of Carluke come together every year on Remembrance Sunday to honour courage and “remember the cost of that terrible conflict and others since”. “This year our centenary Remembrance Service will be a special one,” he added. “It may sometimes be a necessary evil but no war can end war. “Yet courage with relentless determination can—when it is the courage to pursue justice, to defend the weak, to stand up for what is right and good and stand against what is wrong. Businessman, Sir Angus Grossart, who grew up in Carluke, paid for special road signs that have been erected in memory of the three Victoria Cross recipients, who all have streets named after them. A graphic of the three medals adorn the signs, which bear the words “Carluke, a town called Courage”. The phrase was coined a few years ago by Jack Murray, an ex Scots Guardsman who was surprised to learn the town had so many war heroes. 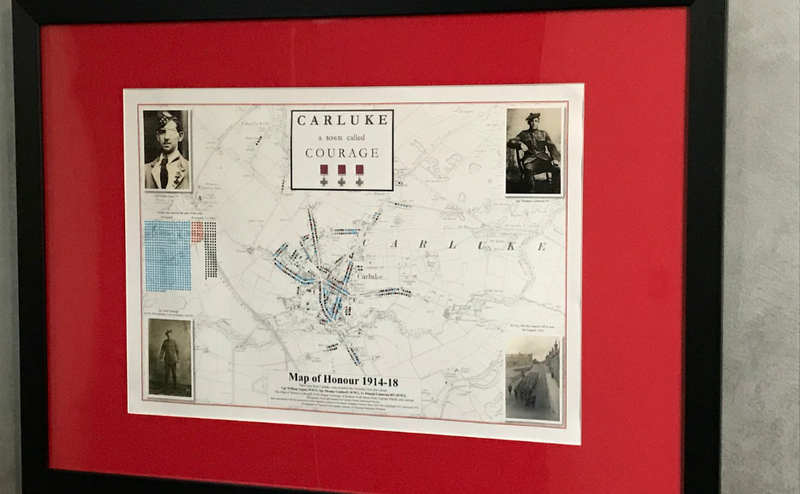 Sir Angus has also sponsored a Map of Honour’ which is based on a 1912 map of Carluke, which is hosting a Remembrance Day parade this year. It shows where the three VCs lived and a black dot represent each man who was killed, a red dot to represent each man who returned with physical wounds and a blue dot for those who served and returned with no physical wounds. This map is based on a 1912 map of Carluke and plots were soldiers lived. A total of 225 men from Carluke died during the First World War.